Ways to Support — The Haitian Project, Inc. The Haitian Project (THP) is pleased to announce Living Life Deliberately – A Missionary’s Journey with THP Director of Community Development Christina Moynihan. Click to learn more about this popular speaking tour at Catholic parishes and schools around the United States. There are countless ways that individuals, parishes, schools and organizations can build community and raise support for THP. See the list below for a few ideas and be sure to contact our Office of Community Development for more info! 1. Host a “Haitian Coffee.” Invite people to your home to enjoy some Haitian coffee and view one (or more) of our many THP videos. These events are great to plan around holidays or birthdays but can also be hosted throughout the year. Please call or email our Development Office to request some coffee and a copy of these videos. The Office of Development can help to create invitations. Videos can also be found under "Media" and then "Videos" on our website at www.haitianproject.org. 2. Host a Community Dinner. A great way to provide more in-depth information about our work in Haiti and build the strength of the local community is to gather for a meal! Working with local vendors for donations or discounts, provide a nice meal and an evening of entertainment. 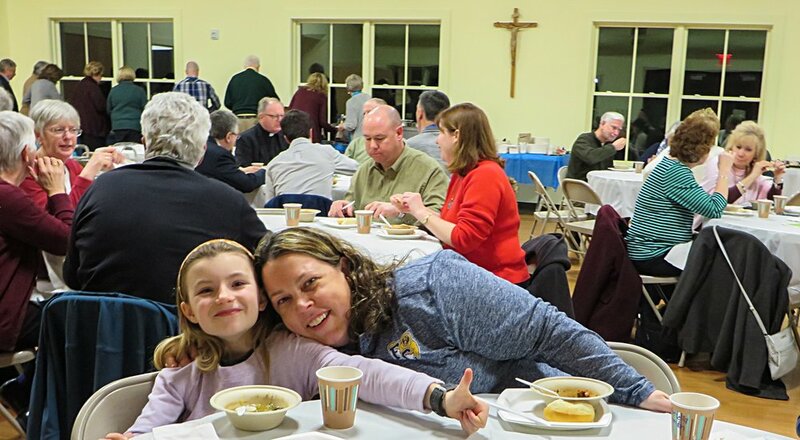 A dinner can be hosted at your parish or another venue willing to provide the space. THP videos or a photo slideshow can be used during the evening. Tickets for the dinner can be sold in advance and advertised on our website. Other activities can also take place during the evening such as an Art Auction or Rag-A-Muffin Sale. Contact the Office of Development for help with materials and creating invitations. 3. Invite a THP Representative to Speak. The Haitian Project (THP) is pleased to announce Living Life Deliberately – A Missionary’s Journey with Christina Moynihan, a popular speaking tour at Catholic parishes and schools around the United States featuring THP Director of Community Development Christina Moynihan. THP President Deacon Moynihan and THP Development Staff are also prepared to speak at churches, universities, schools, clubs and local organizations about Louverture Cleary School and Haiti. Please inform our Development Office before making arrangements to have a speaker at your local venue. 4. Have a Rummage Sale. In Haiti, the LCS community understands the importance of recycling because of the lack of a formal trash disposal service in the country. Students, Staff and Volunteers find ways to reuse or properly dispose of items so nothing goes to waste. Rummage sales are an excellent way to recycle items in the U.S. and live in solidarity with the community at LCS. For more than a decade, THP supporters have raised funds and support through these sales! 6. Take Someone out for Dinner or Coffee. Taking a handful of materials with you, take someone who you think might want to learn more about THP out for dinner or coffee. In follow up, you can ask them if they would like to receive THP’s weekly community updates via email. 7. Raise Support in Honor of a Family Member’s Birthday, Your Birthday, Christmas or Wedding. Tired of receiving gifts you don’t need or can’t use? Tell friends and relatives to send a gift that will always be put to good use – the education of students at LCS. 8. Send Personal Letters. You might be surprised to find who in your personal network wants to help. Write to friends, family and community members to tell them about our mission and your personal experience with THP. Your Birthday, Thanksgiving, and Christmas are great times to write when people are looking for ways to give. 9. Share THP Community Updates. Anyone wanting to keep in touch or learn more about THP can receive the weekly community updates by email. This is an easy way to keep people connected at no cost! To add someone to the list of recipients simply email or call our Office of Development. 1. Second Collection. Many churches are willing to give a second collection to THP if a speaker gives a short 5-10 minute talk about our mission after Mass or service. This helps raise support for THP and the parish. Parishioners become inspired within their community when they understand that their parish is giving to an exciting mission that produces real solutions to those most in need. 2. Tithe. Many parishes give annual or multiple tithes to THP, which is decided by the pastor or stewardship committee. Please contact the Development Office for material you can present to your pastor or committee. 3. Deacon Moynihan Assist at Mass. Part of THP’s spiritual responsibility is to assist the Catholic Church in its mission. As an ordained deacon, Patrick Moynihan can assist at Mass and give a homily in response to the Gospel. Please contact your pastor and the Development Office to discover if this would be the best option for your parish and Deacon Moynihan. This communication and visibility helps us build a community rooted in spirituality. 4. Donation Table. Many parishes welcome a THP booth in the back of church with materials and a display board describing The Haitian Project.. Donation envelopes or a donation box can be setup alongside the materials. If a donation box is displayed, a THP community member must be present at all times. The Office of Development has a wealth of ideas and materials for working with elementary schools, middle schools and high schools. To engage your school to become more involved, please contact the Development Office and we will be happy to help! To contact THP's Office of Community Development, please call 401-351-3624 or email development@haitianproject.org. To download a .pdf of this document, please click here.